What I heard at both events: safety concerns, frustration with legislators and calls for action around gun laws. Hope for children, love for community and citizens flexing their civic muscles. My call for questions at these two events was reinforcing Illinois Newsroom’s mission to listen, like drive-hundreds-of-miles-and-sometimes-stand-in-sleet listen, and its mission to be responsive to community-identified concerns. A couple years ago, our lead partner station, Illinois Public Media in Champaign-Urbana, hosted a community conversation with local survivors of gun violence. From our perspective, the issue of rising violence meant the stories of those affected needed to be told. When hard data arrived and confirmed the increase in gun violence for not only Champaign (where there have been at least 168 people wounded and 14 people killed between 2015 and 2017), but across the state outside of Chicago, the Illinois Newsroom collaborative of six public media stations defined the topic as a priority. Our reporters set to work and I prepared to attend these two events. As media creators, our team is in a position of influence over what information people receive through our airwaves and web presences. We’re tasked with making challenging decisions about the information’s relevance (i.e.What do citizens within our listening areas need or want to know?) My job is creating pathways to receive as much community input as possible, either digitally or in person, and to align our team’s journalistic priorities with those of the people we serve. I love my job. I received 63 questions from 48 ralliers at the March For Our Lives and Illinois Gun Owners Lobby Day in preparation for the release of our gun violence series airing May 14th. Some questions will be indirectly answered in radio features, while others will be directly answered in web posts. Some questions were simple to answer like “What is the difference between an automatic, a semiautomatic, and a pistol?” and some were unanswerable like “How can we make sure a mass shooting never happens again?” We wish we knew. Going forward, Illinois Newsroom is committed to gathering as many insights, perspectives, and questions as possible on the topics of education, politics, health, and the environment in Illinois. You can help us by asking a question through our website here, and following us on Facebook and on Twitter at @ILNewsroom where we’ll call for questions related to specific topic areas or investigations often. 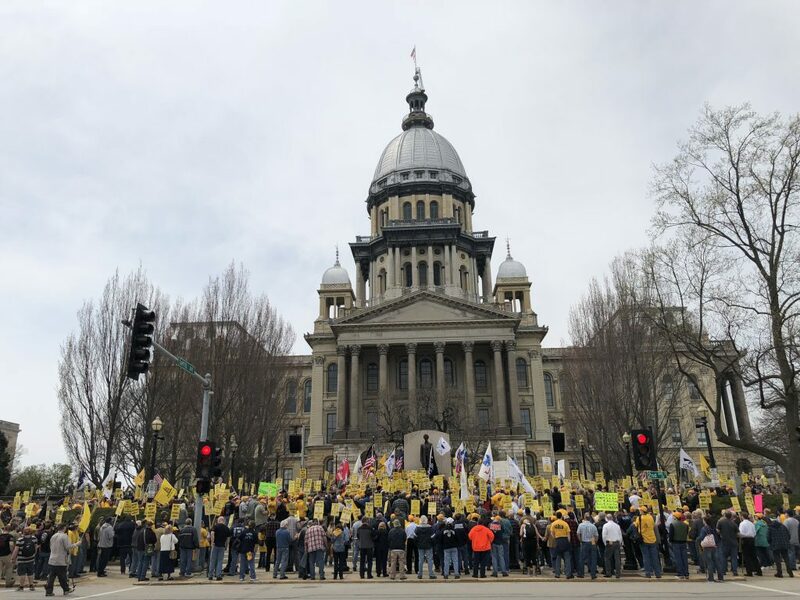 A selection of questions gathered from ralliers at 2018 Illinois Gun Owners Lobbying Day and Champaign-Urbana’s March for Our Lives. As I transcribed and reexamined the dozens of questions I had collected, I discovered matching priorities across the two groups. Both sets had similar questions about law enforcement, schools, and gun legislation. In fact, when I mixed up the questions, I couldn’t tell which questions came from which group. But you can try to guess. I hear that some of our laws are the strictest in the country, however the gun violence permeates some of our communities. So what’s the disconnect between the laws and how they are implemented? Where’s the breakdown? If we aren’t enforcing the current gun control laws to their full extent, why would more laws work? How do we create an atmosphere where teaching and learning can happen [in schools]? How much does the threat of gun violence become part of the school routine? Are they doing active shooter drills every month and evacuating students? What [legal] reforms or modifications have we made since Colombine? What kind of legislation has been proposed since the 3/24 march & 4/20 student walkout? What legislation is pending in regards to gun control? Why are we talking about rifles when most violence is perpetrated by pistols? What overarching national organizations can do research on gun violence to have meaningful data?